Here is an introduction to speed training for runners that will make most of us faster. Most runners and walkers training with Boise RunWalk want to get a little faster. Maybe your goal is finish your target distance with a smile on your face. Coach Steve has set this goal many times. After accomplishing that awesome goal, runners and walkers often realize they could go faster. They know they can best the previous time, but how? Here’s an introduction on how to increase your speed and your smile. One goal is to simply beat your previous time. Another goal will be to run a specific race pace. Many runners who are making the decision to increase their speed for the first time can make a realistic goal of “just going faster” at their next event. This is the focus of this article, to help people just run faster. For a more specific goal-pace, we believe you can accomplish your goal pace by following the methodology laid out here while working with your coach. Bob ran his first half marathon 3 months ago in 2 hours and 30 minutes This equals a pace of 11:27 minutes/mile (mps). Bob wants to beat his time in his next half marathon 12 weeks from now. Bob averages a base of weekly miles that keeps him injury free. Bob doesn’t really care what his next time is as long as he beats 2:30. Sally on the other hand, ran her third half marathon 3 months ago. Here time was an even 2 hours, a pace of 9:09 minutes/mile). Sally has been getting faster in her previous two events but she’s not sure she can maintain her streak of faster times without refining her training plan. Sally’s goal is an 8:45 pace for her next half marathon. Sally also has maintained an established base of weekly miles, and she too is injury free. Sally uses the guidance from her coach. She increased her speed by focusing on overall nutrition and hydration as a lifestyle, losing a little weight, running longer distances to build endurance, refining her race day fluids and carbs strategy, and joining Boise RunWalk. Sally is also modifying her run walk intervals and improving her running form and technique with her friends in the group. In the Boise RunWalk group training programs, Bob is learning how to increase his core-strength and improve his lifestyle nutrition and hydration practices. He attends Saturday morning discussions on race day nutrition and fluid replacement strategies. Bob will run longer distances over the season, and this will build his endurance. Let’s focus now on the speed work he can do. If you have not been timing your workouts or do not have a good idea what your current pace is, learn your current pace by tracking your time/pace with a sports watch or GPS device. When purchasing one of these, consider one that provides interval alerts (beeps) so that you can set your interval alerts for run/walk intervals and speed intervals. Having a device that beeps at you during your speed-work, or during your event when it’s time to walk or run, is very helpful. In Boise RunWalk, your longest weekly distance is scheduled for Saturday. Saturdays are not the day you focus on speed work, but instead focus on building endurance by going the distance at a sustainable long-distance pace. Set aside one of your mid-week workouts and substitute for speed work. Do not pick Friday or Sunday for speed-work. Tuesdays or Wednesdays are very good choices if you are following the Boise RunWalk training plan. Your warm-up for a mid-week speed session should be 10+ minutes of light jogging. Speed Intervals – What is a 8×30-30? The speed intervals could follow a weekly plan as shown in the chart, Recommended Speed Workouts. Your first workout is “8×30-30” which is 30 seconds fast followed by 30 seconds slow, and do this 8 times in a row. How fast you run during the fast intervals is determined by a couple factors, and you may need to make adjustments as you become more knowledgeable of your body’s response to speed-work. You should run the maximum pace you can keep for six minutes. If you don’t know what pace you can handle for 6 minutes, either make your best estimate or conduct a 6-minute test for yourself. In our example, let’s say Bob will keep this decision simple, and run a pace fast enough that it feels like real work, and still be able to complete the eighth interval at the same pace or slightly better than the first interval. The workout should leave you feeling worked but not wiped out. Experiment with and learn your capabilities! The cool-down is part of your workout. 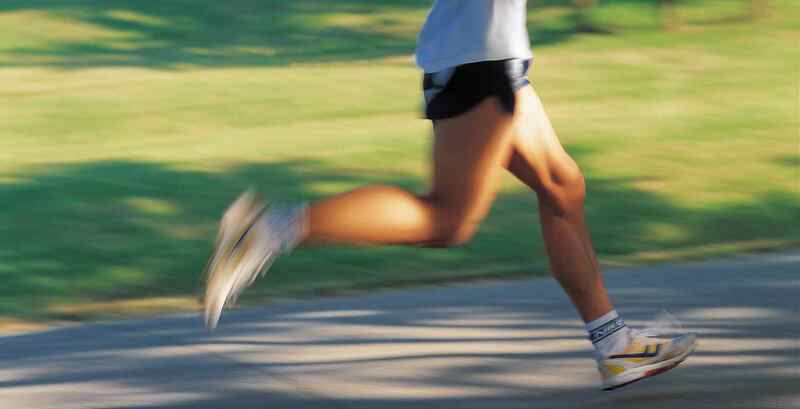 Be sure to cool-down so as to begin flushing out of your running muscles the lactic acid that speed-work will produce. Don’t neglect to stretch afterwards. By using your weekly long runs to build your endurance, and working some basic speed training into a mid-week workout, you will get faster. Small, incremental improvements are a great way to feel the thrill of success, while helping to avoid injury. If you are getting faster, what more could you hope for? We already know the answer: practice running faster. This prepares your mind and body for success!